Courses are held once a week from 4:30 p.m. to 6:45 p.m. The school year consists of 30 weeks. Generally there are between 9 and 15 students per class. 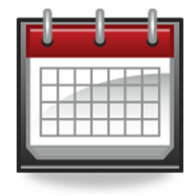 In general, the school calendar follows the Birmingham school district. Our classes will be cancelled if unforeseen school closings of the Berkshire Middle School (weather related, lock downs, ect.) occurs. Make-up day will be the following Friday (new) if possible. For up to date and detailed information, please call the DSB hotline at 248.755.7317 or visit the home page. The content of the German classes are guided by the Primary, Secondary, and High School curriculum of the State of Baden-Württemberg, Germany. All school books and additional materials are recent editions of the individual curriculum. 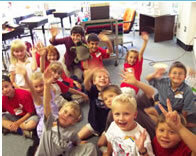 The students learn in a positive environment with the variety of teaching methods. In second grade students will also learn penmanship and will take a "Füller-license". Dictation, essays, and literature are part of the academic structure, which will be both read and discussed in all grades. As part of the program, the students will be introduced to the German culture and its holidays: The traditional lantern walk (lower grades) and the visit of Nikolaus for all grades are part of the program. The DSB provides the students with access to an onsite, extensive library with German books, games, audio books, CDs and German DVD’s for all age groups and is updated regularly. This program is for students who have developed German as a second language due to long period abroad, multi-lingual parents, or for American families who lived in Europe and would like to maintain and improve their German language skills. The classes are taught in German and are communication and action oriented. Age appropriate German language skills (oral and writing) are necessary to attend classes. Entrance tests may be required. Vocabulary, grammar, reading and writing will be theme based. German culture is part of the program as well. The younger children will be part of the traditional lantern walk and Nikolaus will visit all classes in December. Upon completion of the program, students will be able to take several national tests (AATG (level 1-4), AP German, and the German Proficiency Test (Deutsche Sprachdiplom IVA-A1/A2, DSD l + ll). Once students have passed the highest level of the DSD-II, they are considered proficient in the German language to attend German universities. Special DSD-II/AP-Prep. classes prepare the students for the "Deutsche Sprachdiplom" according to their skills as well as prepare the students for the AP-German test. Students are responsible to sign themselves up for the AP-Test taken at their individual High School. In general sign-up for AP Tests are in February, tests are taken in May. Classes are usually held Thursdays only from 4:30 p.m. - 6:45 p.m. This class is offered to 2 ½ -4 year old children together with a parent on Wednesdays or Thursdays from 4:30-5:30pm. The world of music is introduced through movement, touch and playful experience. The children's natural ability to sing and to move rhythmically will be broadened by singing age appropriate German songs, speaking finger games, rhymes and rhythms. Creative play with different materials for seeing, hearing, touching as well as first sound experience with basic instruments, rhythm movement and dance are fundamental elements of this fun filled class. Experienced Music teacher teaches the one hour classes. The teachers of the pre-school program (Kindergarten) enthusiastically prepare a two year lesson plan for the young students (3.5 - 5 year old). Two teachers in each class (depending upon group size) make it possible for children to learn at their individual level and pace. They will be introduced to various playful interactions with the German language. German nursery rhymes, finger plays, fairy tales, and songs are part of the program, as well as gross and fine motor skill, development tasks, and free playtime for make believe. Creating their own lanterns for the famous lantern walk at school, the visit from "Nikolaus" in December, as well as a "Fasching/Karneval" celebration, is part of bringing the German culture closer to the children. Regular visits to the school own German library is part of the lesson plan, where they can find age appropriate books and games. The content of the Preschool classes are guided by the orientation curriculum for Preschool Education of the State of Baden-Württemberg, Germany. Children need to be potty trained. "Vorschule" is based on the Pre-school program and is designed to prepare 5-6 year old students for first grade. Linguistic and motor skills are added to the program. Exercises to increase concentration and focus are included for German vocabulary and overall academic performance. Regular hands-on science experiments are part of the curriculum as well. Hand puppets like "Kasper and Princess" are introducing the experiments/game sessions. German culture is part of the program as well. Students will make their own lanterns for the annual lantern walk in November, and will perform the St. Martin play. Nikolaus visits in December and in February they will celebrate Fasching/Karneval. The students will have several presentations in front of the class and an audience. Regular visits to the school own German library is part of the lesson plan. These classes are designed for students attending American Kindergarten during the day. These classes are designed for students who require French/(Latin) as a second language based on the curriculum for the German "Gymnasium". The courses are offered as Beginner class level 1 (grades 5 to 7) and Advanced classes level 2 - 4 (at least one or three years of French). School material used is officially approved by the German curriculum. The classes are taught in French with German-French or in Latin with German-Latin vocabulary. Classes are held Tuesdays from 4:30 p.m. - 6:45 p.m. Starting with 5th Grade/DaZ-5, students are taking different levels of the AATG-Tests (American Association of Teachers of German). These tests are recognized in American High Schools. 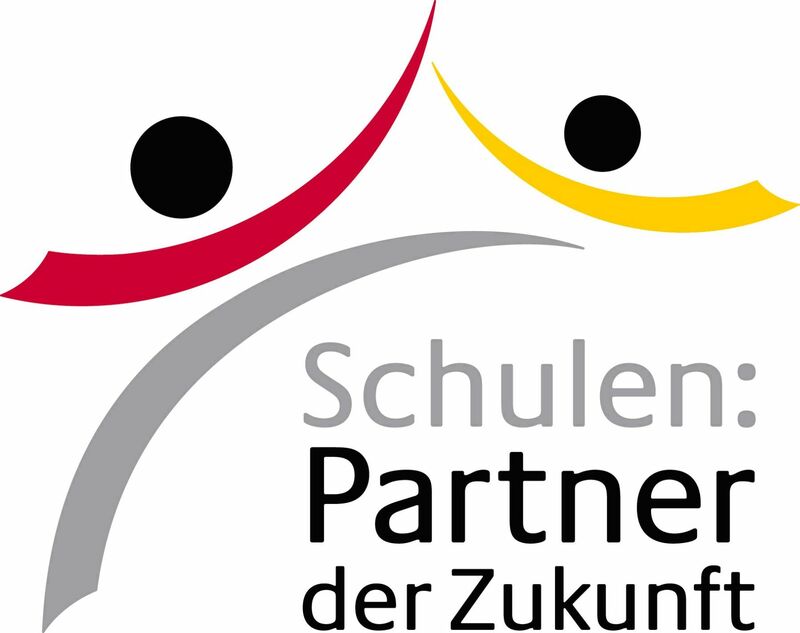 Starting 7th Grade Native Speaker/DaZ-8, students will be prepared to take different levels of the German Proficiency Test towards the Deutsche Sprachdiplom (DSD). 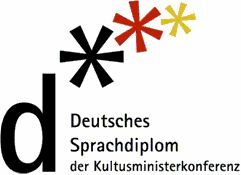 DSD is offered from "Zentralstelle für Auslandsschulwesen", is prepared by the KMK (Kultusministerkonferenz) in Germany, and accepted in all states of Germany. Achieving the highest level of the German Proficiency Test (DSD-II), students have the required proof of German Language skills to study at a German university. All DSB students are eligible to participate in the different tests offered during the preparation classes. 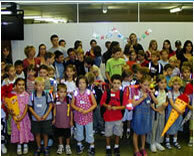 In addition to the regular academic curriculum, German culture and customs are taught. Topics such as Fasching, Easter, St. Martin, Nikolaustag, and Christmas are part of the learning experience. Visits to the well-equipped German library enriches the program. The library offers a large variety of recent publications of books, games, audio books, and German DVD's and provides opportunities to experience the German language in a variety of ways. The majority of books are part of the German based "Antolin" reading program to which DSB students have access to during enrollment. Weekly homework strengthens and improves the topics studied during class. It is a very important and necessary requirement for the learning success and needs to be supported by the parents. 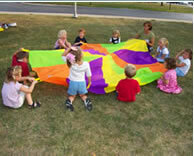 Weather permitted, students will spend recess outdoors on school grounds. Report cards are issued at the end of each semester. Students receive detailed information about their academic development and achievements. Attendance of a minimum of eight classes per semester is required to receive a report card otherwise a participation confirmation will be issued.